Dragon fruit flavor has its own unique taste that makes it stand out on its own. This flavor comes out perfectly when combined with pineapple or mango flavor. 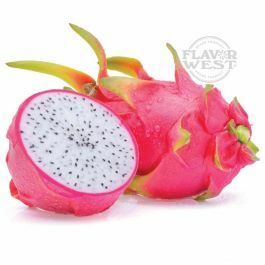 Type: Dragon fruit water soluble flavoring. Ingredients: Natural and Artificial Flavoring Water, Ethanol and Propylene Glycol. USP Kosher Grade Flavoring/ Usage Rate:15-20% for E-use. Flavor Suitability: Drinks and beverages, desserts, pastries, candies, lip balm and more. Specific Gravity: 1.10 No Refunds on Flavoring. Found this a bit mild at 20% mix so I increased it a bit and it is better.